John Martin (1789-1854), who was born in Haydon Bridge and went on to become one of the most popular artists of his day, will appear in Bonhams 19th Century Paintings auction on September 29. Martin's works now hang in the Laing Gallery in Newcastle and the Tate Gallery in London, and he is famed for his apocalyptic scenes set in dramatic landscapes. 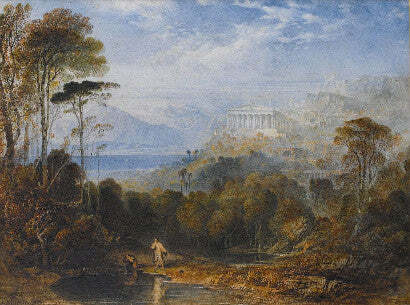 Now, Bonhams are selling one of his less-common classical landscape scenes which depicts 'Diogenes throwing away his cup'. The philosopher, who aimed to live as frugally as possible, saw a child drinking from his hands and threw away his cup, remarking that "a child has beaten me in the plainness of living". Many of the artist's works depict biblical or moral tales, which greatly appealed to his Victorian audience at the time. Today, Martin's paintings rarely appear at auction, and this particular example is fresh to the market and in exceptional condition. It is expected to bring £10,000-15,000. Elsewhere, a major exhibition of the artist's work will be shown at the Laing Gallery in 2011 before moving to Sheffield and then the Tate Gallery, London. Charles O'Brien, Department Head, commented: "It is always exciting offering works which generate local interest. The John Martin watercolour in particular is a gem and deserves to make a good price."